We still remember the month - January, 2013. That was the month that Sinn announced the retirement of the Sinn 203 Arktis. The Sinn 203 Arktis had long been one of our favorite Sinn watches, ranking up there with the Sinn EZM 1. We loved the dial, the field tests, the durability, the technologies and the build quality. An exceptional watch, and a sad month. Imagine our surprise when Sinn told us on a confidential basis that an all new Sinn Arktis II was in development - not a "re-release" of the previous model but one that took the design and technology even further. The original Sinn 203 Arktis was introduced in 1999, so the new Sinn 206 Arktis II celebrates the 20th anniversary of the first diving chronograph to feature Temperature Resistant Technology. When the final pieces of the Sinn 203 Arktis sold out years ago, the Arktis project did not die - it was merely "put on ice" as are all pieces in this series. Each Sinn 206 Arktis II watch is designed to operate in temperatures ranging from -45 C to +80 C. One of the more interesting areas of a Sinn factory tour is the refrigeration room, where all pieces of the Sinn 206 Arktis II watches are frozen to test their ability to operate at extremely low temperatures. Open the freezer and you'll find watches covered in frost where a technician periodically wipes away the covering to test the movement of the second hand and the accuracy of the timekeeping. Making use of Sinn's special oil 66-228 with a copper sulphate capsule, EDR seals, and a protective inert gas filling contribute to the extreme temperature resistance of this watch. These feats of engineering are essential to a watch designed to conquer the coldest and most demanding race in the world, the Yukon Arctic Ultra. 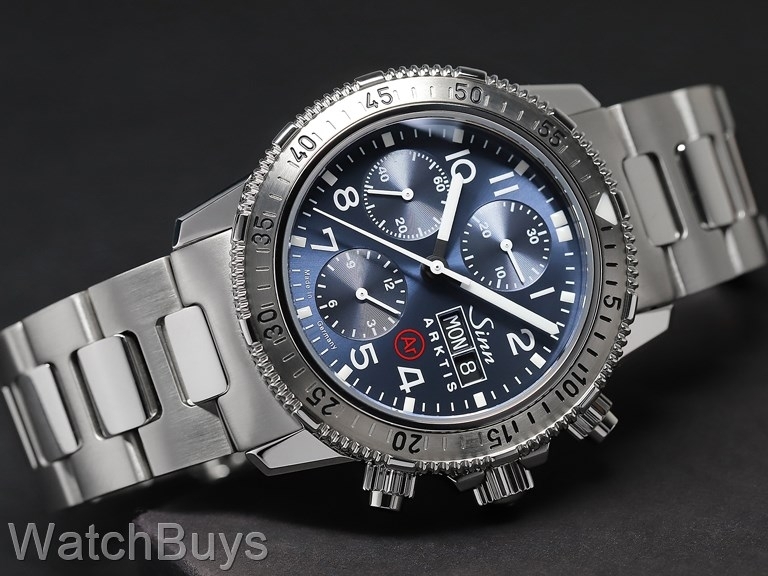 Its signature arctic blue dial, durability in water, high altitudes, extreme cold, heat and other punishing conditions made the Sinn 206 Arktis II a "superwatch". The new 206 Arktis II differs from the original Sinn 203 Arktis in a number of important ways. First, the case is all new for Sinn, and is 43 mm rather than 41 mm. Sinn refers to the case as a "contemporary iteration of their classic diving chronograph". This new case is not only larger, but features a mixed finish (polished and satinized) where the original was all polished. Finally, the case features a sapphire crystal back where the original used a solid case back as the standard option. While the original Sinn 203 Arktis used screw down chronograph pushers to enhance water resistance, the Sinn 206 Arktis II takes advantage of Sinn's D3 System to maintain a water resistance of 300 meters without the need for screw down pushers. The result is an easier to use chronograph on the Sinn 206 Arktis II as the pushers are always ready to operate. To remain as true as possible to the original design of the Sinn 203 Arktis, the pusher housings retain the screw down push piece look. No discussion of this watch would be complete without highlighting the dial. Many owners of the original Sinn 203 Arktis commented that the dial was the most interesting on any watch they had owned, and it ranks among our favorite Sinn dials. So we are obviously thrilled to have a Sinn watch with a deep blue electroplated dial with sunburst decoration back in the collection. This is a dial with attitude, and it is the spirit of the Arktis. The 206 Arktis II is built for commercial and military operations in extreme alpine/high-altitude settings. Sinn's Dehumidifying Technology prevents moisture intrusion in virtually any environment. The stainless steel construction is corrosion resistant and is slow to assume the surrounding ambient temperature. This watch is fitted with a Sinn stainless steel H-link bracelet with locking clasp. We are now accepting reservations for this watch which are expected to start shipping at the end of May.